The trip runs from June to the end of September. This trip is public. You may book as one person, but the trip runs with a minimum of 5 people. Groups larger than 5 people will be split up among guides. Children 10 years or older with hiking confidence may join. Previous ice climbing experience is not necessary, but a decent level of fitness is required. What to bring? Comfortable sportswear, energy bars, a picnic lunch, lots of water, sunscreen, sunglasses and a camera. Pickup is possible from Interlaken hotels and the Interlaken Ost and West train stations. After the activity, you will be dropped off where you were picked up. Transportation is possible from Interlaken hotels and the Interlaken Ost and West train stations. After the activity, you will be dropped off where you were picked up. If you need to arrange a meeting point, please let us know. The glaciers of the Swiss Alps attract climbers and hikers from all over. Witnessing icy sheets and massive frozen formations creates a thrilling and unforgettable experience. 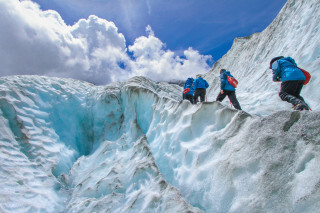 Hike across a the Stein Glacier to ice climb a route down the blue crevasses of the Swiss Alps. This glacial adventure welcomes those with or without ice climbing experience. 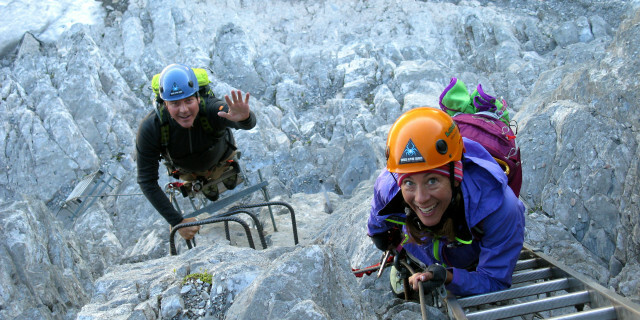 Your certified mountain guide brings all the necessary equipment when he or she picks you up from your accommodation. After about an hour-long drive to the glacier, you’re introduced to the equipment and techniques. The group sets off on the glacier for a hike through across the 4km (2.5 mi) long frozen expanse. The frozen ice creates patterns and shapes that seem almost sculptural. When you reach the crevasse, the climbing adventure begins. 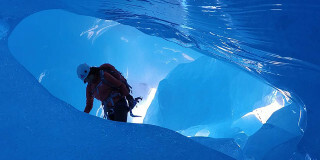 Abseil down a crevasse of blue ice, then use your ice picks and crampons to secure yourself into the wall. Ascend up the glacier and test your body strength. Your guide offers the right advice to get you climbing up the wall in a safe, fun environment. After a few hours of climbing, a lunch break allows for time to rest your muscles and take in the magnificent landscape. The mountain peaks coming through the glacier create a jagged environment of rock mixed with ice. When your body has rested, you continue the climb for a few more hours before returning back to Interlaken. Discover the unique beauty of the glaciers sitting high in the Swiss Alps. Scaling these frozen gems takes climbing to a whole new experience.